How To Get FREE Traffic To Your Website Or Blog! Last updated on October 17, 2018 By Nat 6 Comments This post may contain affiliate links. We appreciate you supporting Rags To Niches! Full disclosure here. If you’re struggling to generate even a trickle of traffic to your website or blog, you’re certainly not alone. Generating traffic can be one of the hardest things to achieve when you start a blog – and then you have to keep it coming too. 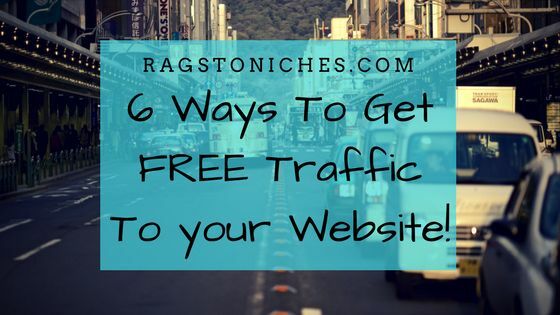 So, today I’d like to share with 6 ways that you could use, to get free traffic to your website! (Just to say, I pretty much use the words, “blog,” or “website,” interchangeably!). So, what’s the first method? 1. It’s good old SEO! Often, SEO is really not what people want to hear when it comes to getting free traffic. This may be because, it’s not an automatic thing. Posts and pages take a while to rank and then move up in the search engines. And it can be a bit like shooting in the dark – even when you think you’ve done everything right, there’s no guarantees you’re going to end up on page 1. That being said, taking the time and effort to learn SEO to a competent level, Can pay off big time in the long term. Searching out for low competition keywords, (low hanging fruit – see post here) and writing…. writing… writing away, is still a great way to bring in traffic and it’s not going anywhere. Now, the statistics on these sorts of traffic estimate sites above, are not very accurate at all with their data, for the most part! So, to see the contrast, I’ve also included an actual pie chart from my personal google analytics for the last few months. So, you see it’s slightly more spread out, but still almost three quarters of my traffic in the last three months has still come directly from the search engines. The number one thing that Darren mentions bloggers neglecting, is SEO. It’s quite surprising that bloggers don’t pay enough attention to SEO; despite it often being their no.1 source of traffic! Insane, don’t you think? (Or are you the same?) :). Many of us bloggers will spend a tonne of time and energy on social media, trying to promote our content – but often neglect the SEO side of things. Often, bloggers will wrongly assume that they have to have a lot of technical ability to understand it, but that’s not the case. The basics in SEO are really not difficult to master either, so if you’re not doing it, it’s really something you should definitely should pay attention to. Useful post: 7 SEO tips for beginners.
. Post On Forums/Question And Answer Sites. I wrote a post a while back about how you can make money by answering questions on Quora. What I meant by that is, you can answer relevant questions in your niche and you can link to your own site within your answer, (as long as it’s actually helpful and relevant to the original question!). Now, I’ve personally got slack answering questions, I’m pretty sure I haven’t answered a question on there in nearly a couple of months, (slaps wrist) but I still get traffic as a result of past questions. So, not only do you get traffic to your site from the very day you answer a question, you also get ongoing traffic for months to come. 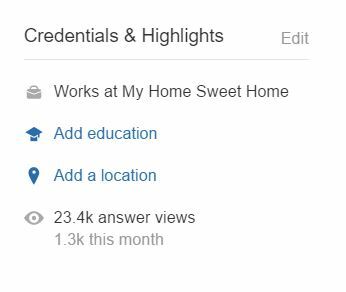 Those are my stats from Quora above. As you can see, I’ve had 1.3 thousand views to my answers this month and I haven’t even answered any questions for two months. Now 1.3k views is certainly not amazing, but my overall effort put into this method so far is minimal, so it certainly pays off. For far more impressive stats, smartblogger.com recieved over 80k views from Quora. It does take some effort initially however, because ideally you want to create answers that are as detailed an helpful as possible. That’s because, on Quora your answers can also be upvoted and the more upvotes you get, the more your answers will be seen by others. I do believe it’s certainly worth the time though and you’re not just limited to Quora. Take a little search on google for forums specifically within your niche – but just be careful to read the guidelines, spamming forums will get you swiftly banned. I don’t do enough YouTube videos myself and if you don’t particularly enjoy the actual filming aspect, as well as editing and so on, then you may struggle initially. However, YouTube can be an effective way of bringing a whole new source of traffic to your blog. It’s important to use SEO with your YouTube videos too, make sure you follow some simple guidelines and you’re good to go. If you’re new to YouTube, I found this post by Backlino really useful. Of course, I had to include social media. Social media can certainly be another way to focus on generating traffic, although sometimes people may go overboard with the amount of time they’re spending vs the amount of quality traffic they actually receive. 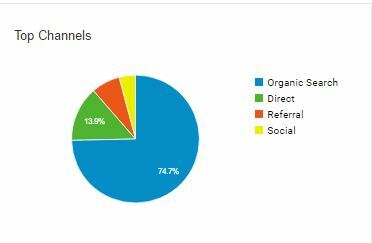 Since a majority of my own traffic comes from SEO efforts, I have switched my attention to attempting to be more active with social media recently. My own feeling regarding this, is that you should choose one or two channels that you’re most comfortable with and then work on excelling at those, by creating a strategy. What I’ve found is that using some sort of automation tool can save you tonnes of time. Recently I’ve been experimenting with tools – twittimer (for twitter) and board booster (for pinterest). Another blog that I dabble with, actually gets around half its’ traffic from Pinterest. When I realised this, (having not really made any effort to utilise it) I started seeking out ways that I could improve on this. What I discovered amazed me, as the amount of traffic some bloggers receive from Pinterest alone, is pretty mind blowing. One of my favourite recent podcast episodes that revealed exactly this, I discovered via the side hustle show Podcast. (Clicking the image will take you to this Podcast episode). Rosemarie talked about generating 400k page-views a month to her blog….. primarily from Pinterest traffic!! There are some downsides to Pinterest traffic though. Often the bounce rate is pretty high and there won’t be much engagement. Therefore, it helps to have something to entice your reader when they land on your page, like a freebie offer in exchange for their email address. Rosemarie made use of this by essentially building her email list from the Pinterest traffic that she generated each month. It’s also worth mentioning how, in this case, Rosemarie really went all out and focused completely on mastering Pinterest and getting it to work for her. This is just another case of where extreme focus towards one goal, can get the most impressive results. Which social media platform you go for, may also be dependent on what your niche is and where they are most likely to hang out. For example, Pinterest is primarily used by women and is very visual, so you’d want to appeal to that audience. There are also many other factors involved when it comes to Pinterest – I found this Pinterest free mini course by Kristen of “believe in a budget,” helpful to get started. In any case, whatever social media channel you want to focus on, try and create some posting consistency and have a schedule in place. 5. Commenting On Other Blogs In Your Niche. You need to be a little careful here. It’s wise to comment on other blogs within your niche, that are not too far out of your league. If you just go over to some major authority blog and start relentlessly commenting on their site and include your website… they probably won’t approve the link to your site. If you start posting really helpful comments over time, then they will be more likely to approve you and you can get some traffic from those sites. I regularly get comments on my blog that are clearly not real comments – but just an attempt to get a backlink. If you suddenly come out of nowhere and start leaving vague comments with your website address, it’s not going to look genuine. So, find the blogs you do genuinely read and appreciate and leave genuine and helpful comments. It will be more of a long term strategy, but something you could consider. 6. Get Incoming Links From Other Blogs. This is distinct from the comment method above, but takes a bit more planning. This method involves finding bloggers within your niche, who have written about some similar topics to you recently – and ask them to link to your related content. You’d need to be cautious about this, because your content will need to be good and you will need to have some authority to make it work. If you just approach some authority site and ask them to link back to your one-page blog, you’re not going to be very successful. In this case, providing that blogger with your content to link to, can benefit their own post because it helps their readers and it will benefit you too. Seeking out those particular bloggers can be time consuming – but you could use something like BUZZ SUMO to help. While this method may not get a high response rate, it can be an effective way of generating additional traffic, and relevant links back to your blog. let’s say you write in the food niche and have found another foodie blog, where the writer had written about how they are really no good at making pastry – and that it’s not their strong point. You happened to have written a step-by-step tutorial on how to create perfect pastry every time – and you suggest they could link to your post. So, not only are you actually helping the blogger by sharing your post with them, but you’re helping their readers too. However, this will mean less competition for you, and more of a potential opportunity. 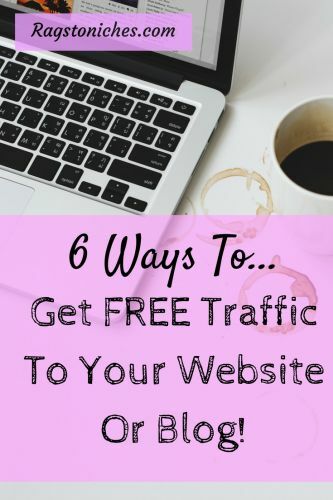 Of course, there are many ways that you can generate free traffic to your blog, these are just a handful of ways that can be effective. I feel the important thing, is not to try and tackle too many methods at one time. Take your time to figure out one way that appeals to you and analyse how well that is actually working for you, before jumping into another method. I admit, I’ve been completely guilty about this myself. I got excited about Pinterest…. and then suddenly an article about Twitter strategies catches my eye… and so on. It is so easy to be distracted by all the different and advice and information out there. But there is no doubt, people achieve the greatest success when they completely focus on one method and master it. So, my advice is, pick a method to attempt and go all out to see what it can do for you. Be consistent, be focused, have an organised plan of action and see it through. As I’ve already discussed, my favourite method for traffic is definitely SEO, because content creation is what I enjoy most. I’m also pretty much an introvert, so the outreach side can be a daunting prospect. If you’re the same, I can relate! So, find what method appeals to you most and you’ll be far more likely to stick with it. What’s your favourite method for bringing in free traffic? Hi Luis – that depends what you mean! Lots of bloggers have gone down the podcasting route and it’s been great for them, including tonnes of new traffic and great for people who want to reach content in a different way. Personally, I love to listen to podcasts, although I can’t see myself doing one. (Although, there is a podcast that has the same name as this blog – that’s totally unconnected to me though). I recommend the problogger podcast. It’s my favourite at the moment. This is some great info. Some people have told me that the make money from home niche does not work well on Pinterest and that I would be taking a chance of getting my site banned. That sounds weird to me but I guess possible. I definitely will go the SEO route and right now I am using Instagram and FB groups as well a little. I appreciate your thoughts here and I can see how easy it would be to get involved with too many social media platforms. I will pick a couple avenues here and try to really master them. I also liked your post on the keyword tool Jaaxy. Cheers Nate – Pinterest can actually work amazingly well for some people. Not if you’re spamming affiliate links, but just driving traffic to your website/blog. I’m not very good with social media myself and can find it overwhelming – so, I think picking a couple and working on those, is the best way to go. Hi Joe, thank you for that. I think everyone who starts a blog or website secretly thinks, (and hopes) that they will be making money really quickly, (no matter what people may say). It takes a while to sink in. But the only way you fail is to give up and stop – if you don’t give up, keep tweaking and improving things – you will start to make money, it’s that simple, (and that hard!). Good luck! !